A special guest arrived at the Dodgers clubhouse in Philadelphia yesterday. 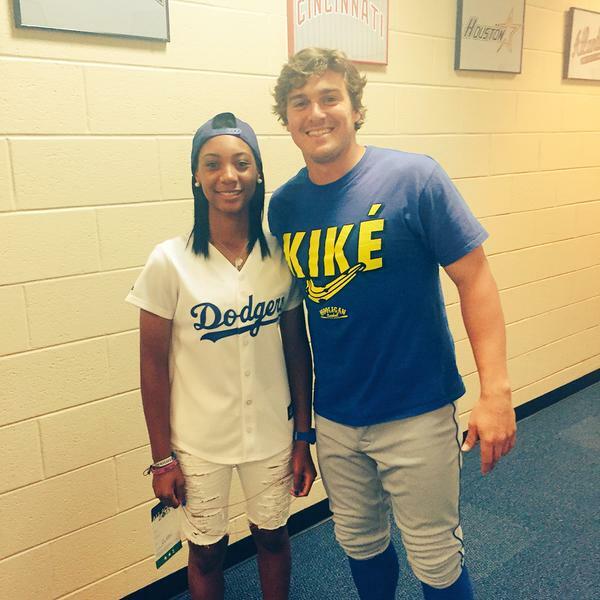 Little League Baseball All-Star Mo’ne Davis visited with the team, and even sported Dodger blue; as evidenced by the photo tweeted above by Kiké Hernandez. Via Robert Keaney at ItemLive.com, "Jackie made history in Lynn." A boost of confidence from management? Via Mark Saxon at ESPN, "Don Mattingly: Dodgers will stick with Joc Pederson." Mark Walter, Chairman of the Los Angeles Dodgers, told a media gathering, "We concluded last year that the best way to give our fans what they want - more Dodger baseball, and a more mature experience at the park - was to launch a long-and-strong integration between two institutions which do it better than the rest. The Dodgers-Brazzers partnership will provide substantial financial resources over the coming years for the Dodgers to continue tricking other teams into giving us their best. Just as we are actively transforming the team and the stadium, we want the Dodgers to be exhibited on the very best adult network in the country - one that will provide an unrivaled fan experience." My well wishes and congrats to the Billingsley family. Via Todd Zolecki at MLB.com, "Billingsley's wife cancer-free, couple thanks Phillies." The couple happily reported that Tiffany has been clear of cancer since last month. She will finish her final treatments in a few weeks. "There were so many things that went right in this process," Chad said Tuesday. Via Night Owl Cards, "10 phenomenally frightful photoshopped Dodgers." Old School reporter Murray Chass writes about the problem with todays reporters, here. I have long respected Rosenthal for his work, since before he began tweeting, but I disagree with him on two points. I wouldn’t call tweeters journalists, and there’s no need to provide minute-by-minute accounts because that’s when tweeters get in trouble. Trade talks and free-agent negotiations can change by the minute, and by the time a tweeter tweets a development he has learned, it can be three developments old.